If you’re going to spend some money on a home improvement project this year, make it a garage door refurbishment because here’s the good news: it offers one of the highest returns on investment. Not only will a new door make your house look great, but a homeowner whose house is on the market could earn up to 13% more on its sale than his neighbor’s property that features no garage. But simply having a garage is not enough. You want a door that will catch the eye and fit your budget. And you also want it to be durable, and straightforward to maintain. 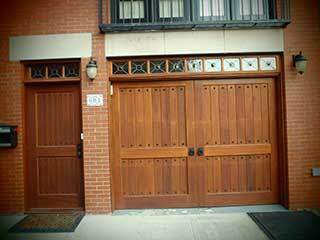 The most popular types of garage door materials today are wood, steel, and aluminum, and each has its pros and cons. We’ve put together this quick cheat sheet to help you get prepared before talking to your garage door specialist. Classy and elegant, a wooden garage door lends natural warmth to your home’s facade that other types of materials don’t. If you’re after a door that will weather wear-and-tear, wood is a great option, although you’ll need to sand and refinish it to protect it and keep it looking good. The major disadvantages of this material are that it tends to be on the expensive side, and the doors are heavy meaning that you might need a high horsepower garage door opener. Not only is steel strong, long-lasting, and environmentally-friendly, it’s also a lightweight material, so your garage door motor won’t have to work too hard. The material can offer good insulation, retaining heat in the winter and staying cool in summer, but this comes at a price. The greatest benefits offered are low maintenance - they don’t rust, warp or crack - and versatility, allowing you to have a roll-up, sectional, or even swing-out door. The downside of a steel garage door is that it can be a bit noisy, especially the common rolling variety, and design options are limited. Doors made from aluminum are becoming increasingly popular, particularly for homeowners looking for very lightweight options. They’re also stylish, with a wide variety of designs and combinations with fiberglass inserts. The major disadvantages of this material are that it’s not very strong and requires reinforcing to give it more sturdiness thus making the price quite high. While the doors that have fiberglass panels look good and allow in lots of light, they also age badly, yellowing with time and requiring a greater degree of maintenance. These three garage door materials are by no means the only kind available, but they have proven to be the ones that are most commonly used. Speak to a trusted and professional company for more information on these and other types of materials that could suit your garage setup.